TPC Overall Rank: #18 out of 2933 rides. In User Top 10: 292 times. User Tracker Count: 554 times. This was a simply amazing dark ride. The fire and 3D were amazing, as was the simulation of falling. A perfect ride. Good Ride. The line has very good theme the news on the ride monitors is a good touch. The offices that you see are also cool. The ride itself is very fun. I like the storyline. But in my opinion the ride has very little thrill, granted its not really supposed to. I just like big drops and inversions not just a scenery around you. Altogether though definatley worth riding.I personally like dueling dragons and dr dooms fearfall better. Havent had the chance to ride Hulk yet but im sure thats better too. possibly the greatest theme park attraction ever. Excellent attraction that is the best dark ride Ive ever been on. Lines can be long for this, but theres certainly a reason for that as this ride is amazing. The 3-D effects were outstanding and I really felt immersed within the story. The plot was excellent as well and the audio quality was great as well. Also, the final fight scene against the Green Goblin was incredible and the falling effect was very well done. One of my absolute top ten, and I dont think could ever fall off that list. I have never before had a ride experience that actually pulled me into the comic book world which I love like this one did. An absolutely amazing blend of a car ride, 3-D effects, sensory effects, and scenery. You practically forget you are in a series of rooms as you soar between buildings and watch the Sinister Six attack you. My favorite part is still when Spidey jumps on the front of the car, making it jump, and then everyone, I mean everyone. young and old for some reason wants to reach out and touch him. Everything about this ride was unique, cannot experience this anywhere else. This ride is amazing! The effects are spectacular mixed in with the 3D screening. The building scene is awesome. The fall feeling seems so real with the effects. 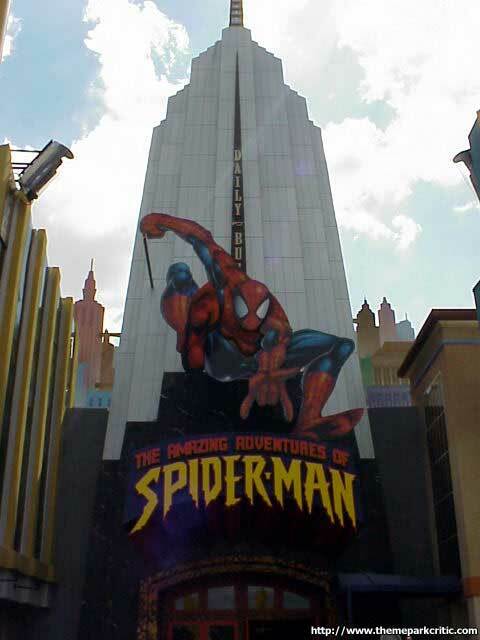 A definate must ride at Islands of Adventure! I was overly impressed! Wow, this ride is really cool. Universal really knows how to show off their 3D technology. I didnt find anything like this one in any Disney park. The car and the images syncronized with each other perfectly that you almost feel like you are flying during the finale. This is probably the best ride in town.